Schedule a dental exam in Marrero by filling out the form below. 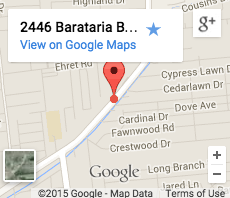 Our office is conveniently located on Barataria Boulevard near the Lafitte/La Rose Highway Exit, across from Cardinal Drive. Please click Get Directions to receive driving directions from Google Maps. We are always available to talk with you and address your concerns. Please feel free to contact us during the following hours through our office phone number or e-mail address. After hours, you may contact us through our answering service or fill out the form below.